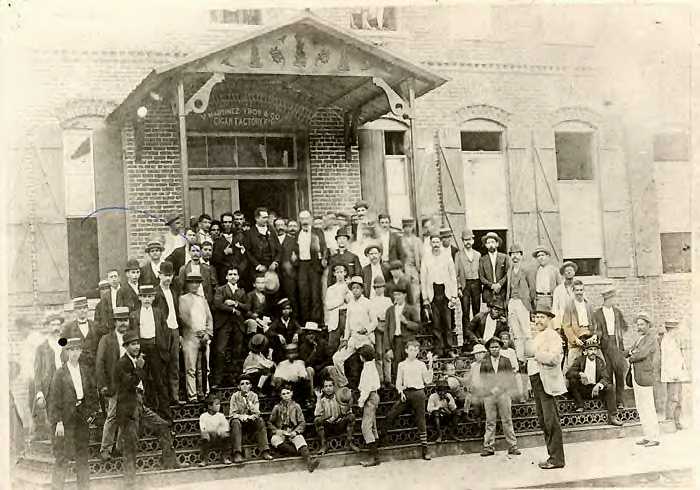 "He who owns the island of Cuba has the key to the New World"
José Martí y delegados del Partido Revolucionario Cubano de Cayo Hueso, frente a la fábrica de tabacos de Vicente Martinez en Ybor City, en Tampa, Florida, en 1893. "If I must choose between rightousness and peace,I choose rightousness." Friend and admirer of José Martí. One of the largest financial contributors to the Cuban Independence War and a constant supporter of the Cuban exiled revolutionaries and the Apostol. Born in Cuba, Hidalgo-Gato fled the island in 1869 to avoid arrest for aiding revolutionaries of the Ten Year's War. After making a brief attempt to start a cigar factory in New York City, he moved to Key West in 1874 and became the first Cuban born cigar factory owner there. Gato was a pillar of the Key West community, actively involved in community politics and enterprises to improve the economoic development of the island. Gato's employees lived in an area of Key West called Gatoville in housing provided by the company. Gato's factory remained in key West long after others had moved their operations to Tampa.